John Krasinski’s daring horror is not so much scary as anguishing, and it is an anguish that neither begins nor ends with the film’s opening and closing credits. We are dropped summarily into a world ravished by disaster. The details are left vague, and the logistics perhaps questionable, though this shouldn’t matter, because it provides a setting for a story whose realism is to be found in analogy rather than in its possibility. All we know is that society has vanished, and that our protagonists must be silent. Any noise invites blind, near-indestructible creatures that make short work of anyone unfortunate enough to run into them. We follow the Abbotts, a family of four with a fifth member expected, who are doing all they can to survive while mourning the loss of a child. Among them is a young deaf girl, Regan, and as such the rest of the family know sign language and are able to communicate safely. We watch their efforts for survival increasingly scuppered by the ever-growing hostility of their surroundings. The film unrelentingly heaps danger upon danger, particularly with the arrival of the expected baby – a noisy affair of course. We see the complexity and arduousness of the lengths this family must go to not only to keep themselves alive, but to introduce new life, and the saddening precariousness of their prospects for success. In watching this unfold one wonders if the situation that they are working to prolong is untenable, if it is rational for them to work so hard at preserving a glaringly doomed existence, and whether it is ethical for them to bring a new subject into it. Herein lies the existential weight of the film. The world of A Quiet Place simply renders more immediately what is true of the actual world; that our being here is untenable. It’s a fear that we all carry, but we all must repress – if one dwells on it too much one might like to scream in terror, but in A Quiet Place, to scream is to die; to give in to the fear of death is to admonish life. This fact of existence motivates some of the films motifs; birth and death alike are announced by blood and screams. The setting is among crop fields, while the monsters’ anatomy includes large scythes for limbs – the Grim Reaper imagery is all-encompassing. In one scene, we see mother and child trapped with a monster in a decidedly intrauterine setting; a flooded room bathed in red light – perhaps saying that death is close by even from the moment of conception. Despite these bleak musings, however, the message of A Quiet Place is arguably a hopeful one. In a world of inexpressible, inescapable horror, it emphasises the value of familial closeness. It perhaps suggests that family is worth surviving for. An alternative response to the complex systems developed to accommodate mother Evelyn’s giving birth is, rather than to question its ethics and rationality, to admire that their most sophisticated methods of survival are motivated by protecting their family – having lost one child, father Lee, as well as his wife and children, are completely driven by this desire to protect, to never relive the guilt that they all feel for that tragedy. Whether one sees this response to guilt as selfish or giving will depend on the viewer’s outlook. Furthermore, Regan’s storyline embodies empowerment in the face of limitations. She refuses to let her deafness keep her confined to the house, and sets out to become one of the story’s heroines. There are undoubtedly gendered readings to be found in the resilience of Regan and Evelyn, particularly where Lee would like to see them constantly sheltered. By extension this empowerment can be attributed to the whole family in their struggle against the perilous conditions in which they live, and further still to the human condition itself. A Quiet Place has a dark take on existence, but it seems to encourage the Sisyphean struggle. Writers Woods, Beck and Krasinski ostensibly want us to decide for ourselves. In my view the film has been largely undersold as merely an effective genre flick (not to say that it isn’t excellent as a horror), when its best merits lie in its marriage of thematic depth to its genre requirements. The scares are not just for fear’s sake, but to viscerally motivate us to ask these troubling questions about the value of life and family. The suspense is loaded with existential doubt, which grips us tighter as the tension builds. The lasting effect of the film is not fear but a strange mix of sadness and invigoration. You’ll lose sleep, but not over the monsters. 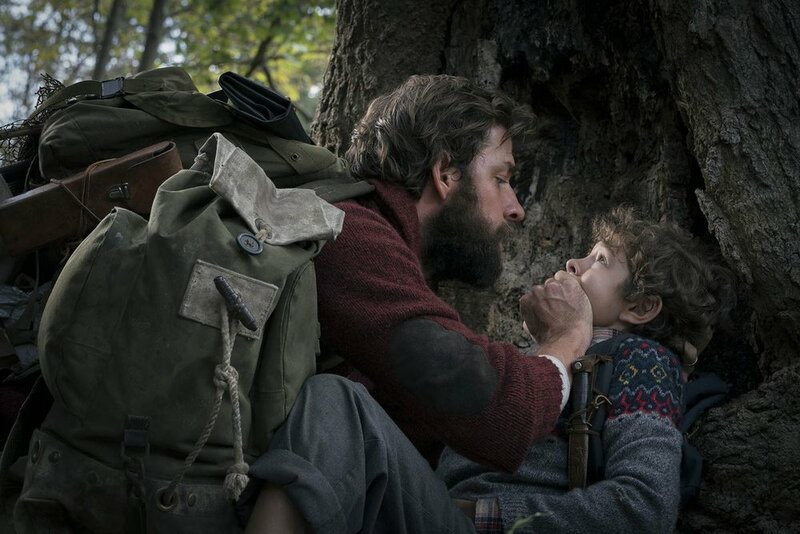 A Quiet Place is held back from being a masterpiece by some irritating clichés, and ironically its main flaw is that it is too loud – monsters are always introduced with familiar low drones and loud screeches. As one reviewer has pointed out, producer Michael Bay’s influence is never too far from the surface. Despite these niggling complaints, however, it stands as one of the most daring, most imaginatively conceived, powerfully executed, and lastingly worrying horror films in recent memory. For Krasinski’s debut, it’s an outstanding achievement, and given its success, it should leave us excited about the state of horror in 2018. The Death of Stalin: Masterpiece of Political Comedy or Historical Travesty?